To view color examples, click below. Mahogany 5.5" flat | 5.0" | 3.5"
Walnut 5.5" flat | 5.0" | 3.5"
Ebony 5.5" flat | 5.0" | 3.5"
Golden Oak 5.5" flat | 5.0" | 3.5"
U.S. DELIVERY - order any or all on this page = 1 shipping rate: Priority Air Mail (U.S.) delivery $7.95 including Alaska and Hawaii. 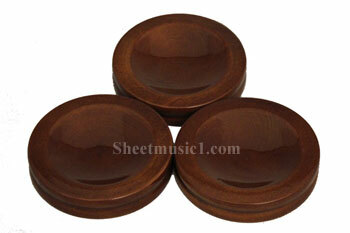 All orders please select "Caster Cups" $7.95 shipping at checkout. Adding sheet music or other items to your order will result in two separate shipping charges. 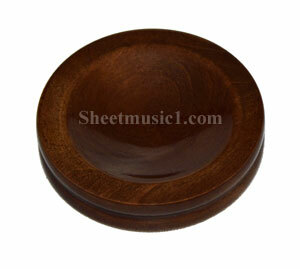 The Royal Wood line of caster cups are carved from the finest oak, walnut and birch woods. Canadian and/or American hardwood, made in the U.S.A. 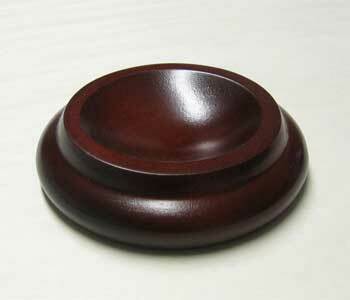 The caster cups measure 5 inches in diameter, and have a felt pad glued to the bottom to protect floor finishes. 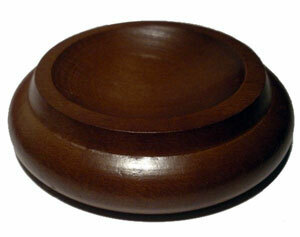 The bowl of the caster cup is 2" in diameter, and will accept wheels up to 1 1/2" wide. Beautiful, flawless, highest quality made. 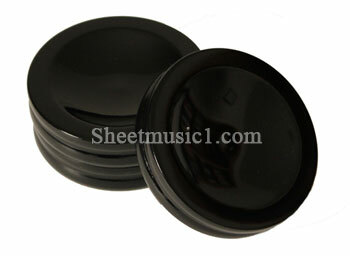 Difficult to find, the flat surface of these 5 1/2" caster cups supports the largest Grand Pianos. 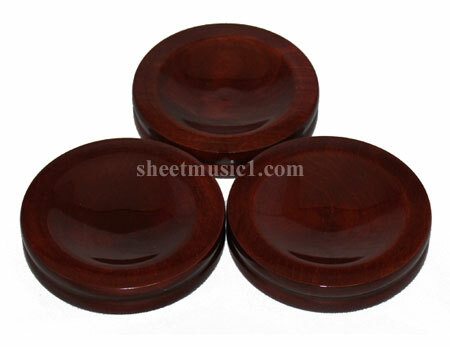 These 3-1/2 inch diameter (concave bowl area for piano wheel is 2-1/4 inches) wood caster cups have been available for years as the most economical floor and carpet protection. For upright pianos or small grand pianos. The above 3.5 inch caster cups are fine for most applications. 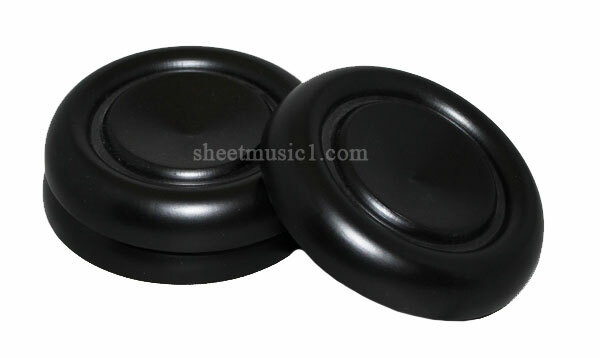 However, if the caster cups will be very noticeable and you need the most beautiful finish for under a satin or highly polished piano, the caster cups below are the ultimate. Manufactured by Jansen, the outside diameter measures 3.5", with an inner diameter of 1 3/4". These caster cups DO NOT have a felt pad. 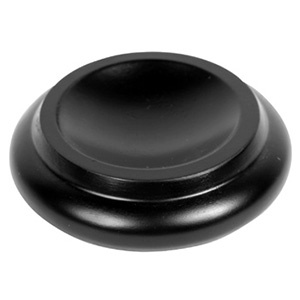 Jansen provides a smooth, sanded surface and does not recommend the use of felt pads under their caster cups. For hardwood floors, or elegant carpeting where clear enhances the quality floor surface. Very strong/durable, will not crack or dull with age. 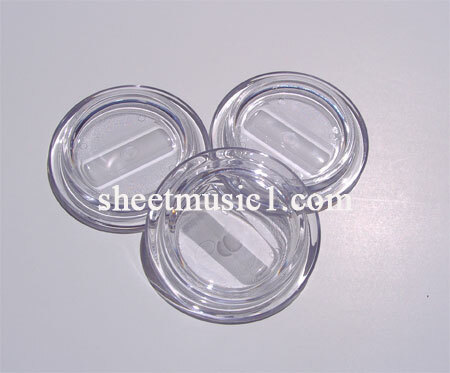 These clear caster cups do not have a felt pad, they are designed to be "see-through" in appearance. In my opinion, the clear flat are beautiful, almost like glass! ROYAL Premier Series Clear/Flat LUCITE -- Outside (bottom) 4 1/2" Inside (flat wheel surface) 2 3/4"
For very large dual wheels, contact Dr. Rein P. Vaga, D.M.A. Price will be $38.00 each. These will be custom made by Jansen, the same folks that make Steinway artist benches. Please email your color requirements (ebony, walnut, particular shade of mahogany), piano size and make. 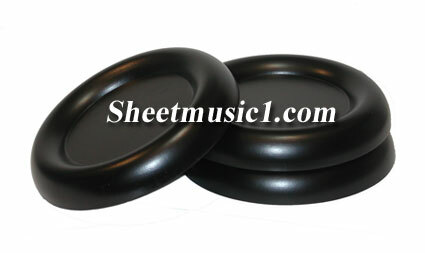 Satin is standard, high polish add $5.00 each. Delivery time is 2-3 weeks - custom made just for you! So, if you buy these caster cups, how do you get them under the legs of your 1000 lb. Grand Piano?? Use one (or more) reasonably hefty person(s) to crawl UNDER the piano, next to one of the legs. Place a couch cushion on the person's back (like a saddle on a horse, so to speak). The way to lift is to push up against a cross-beam or other solid area with the shoulder-blade area of the back while in the crawl position. It's easier than it sounds. When setting piano leg down into the caster cups, point wheels slightly inward toward center of instrument.